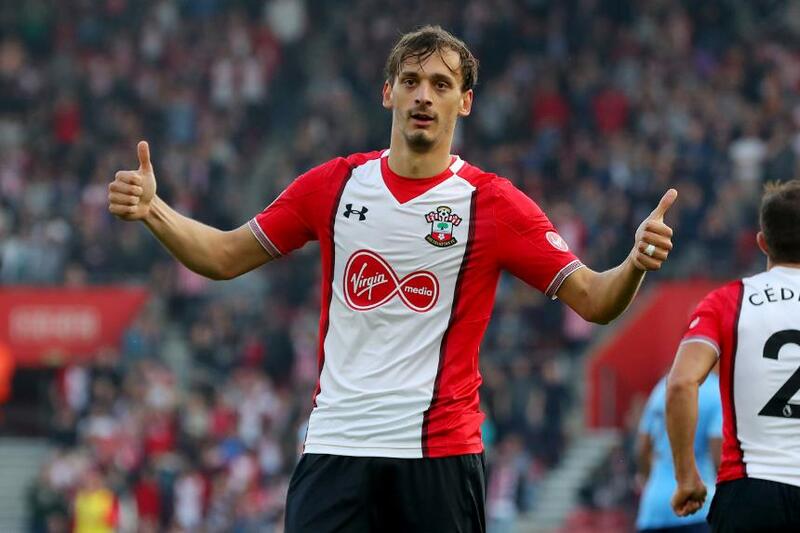 Manolo Gabbiadini (£6.6m) makes a belated return to the Fantasy Premier League Dream Team after scoring twice in Southampton’s draw with Newcastle United. He sits alongside another cut-price forward, Tammy Abraham (£5.7m), who earns a Dream Team bow in an XI drawn from nine clubs. He became the first goalkeeper to register an assist this season via a long clearance, which was converted by Michail Antonio (£7.5m). Hart also recorded five saves to score 34 in the Bonus Points System (BPS) – more than any other goalkeeper. The Arsenal captain earns a maiden Dream Team call-up after his first start at Watford, despite suffering defeat. Mertesacker scored the Gunners’ goal and made a Gameweek high 16 clearances, blocks and interceptions (CBI). The Liverpool right-back returned nine points against Manchester United to earn his second Dream Team appearance. Gomez tallied 35 in the BPS, the top score for FPL defenders, after winning three tackles, supplying three key passes and creating a big chance missed by Emre Can (£5.0m). The Tottenham Hotspur defender claimed eight points from the narrow win over AFC Bournemouth. Trippier recovered nine loose balls and delivered three key passes. Only team-mate Ben Davies (£5.9m) has supplied more chances among FPL defenders (12 v 16) this season. 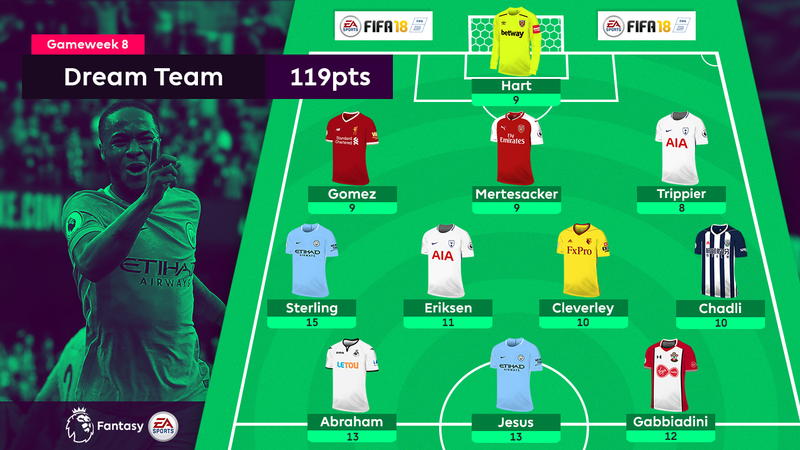 The Hornets midfielder earns Dream Team recognition for his fine start to the campaign, as Marco Silva’s side continue to offer budget FPL options. Cleverley scored a dramatic winner to total 10 points, including his first bonus points since the start of last season. The Dane supplied his second double-figure score of the season in the 1-0 win over AFC Bournemouth. Eriksen has produced a goal or an assist in five of eight matches to climb to the top of the overall FPL standings on 56 points. His 15 points in the 7-2 defeat of Stoke City was the best individual score in the Gameweek. A goal and two assists continued a prolific run of points that have made the winger the top transfer target. No FPL midfielder has scored more goals (six) and no other player has had more penalty-area touches (63). A sublime free-kick at Leicester City earned the midfielder a first Dream Team call-up of the season, his third in West Bromwich Albion colours. The 10-point return offered a reminder of Chadli’s FPL potential, but he faces Manchester City (H), Chelsea (H) and Spurs (A) in the next five Gameweeks. The Brazilian joined Sterling in tallying double-digits in the victory over Stoke City. Jesus has six goals this term and has gained another 120,000 owners ahead of a Gameweek 9 meeting with Burnley, though he could share pitch time with a fit-again Sergio Aguero (£11.5m) in that match. The loanee earns a Dream Team debut, having matched Jesus with two goals and 13 points against Huddersfield Town. Abraham is the top value forward for points per million (6.8) and his next four home matches total only eight in the Fixture Difficulty Rankings (FDR). Two goals and 12 points in the draw with Newcastle United announced the Italian's return as an FPL prospect. Having scored six goals in his first four appearances in all competitions last season, his renaissance as a mid-price forward option would be welcomed by FPL managers.